It’s time to unveil the newest additions to our menu! Read on to learn more about some of our new favorites! The heat is on! 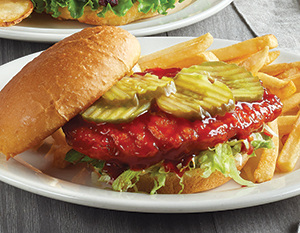 For this new sandwich, we toss a crispy fried chicken breast in our spicy Nashville sauce, and then serve it on a soft brioche bun with lettuce and dill pickles. Big on barbeque? This burger is for you! We start with a bed of BBQ seasoned fries, then top them with a 6 oz. 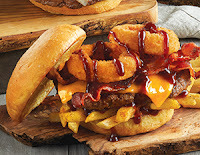 Black Angus burger, cheddar cheese, crispy bacon, onion rings, and BBQ Sauce. This platter is full of your favorites! 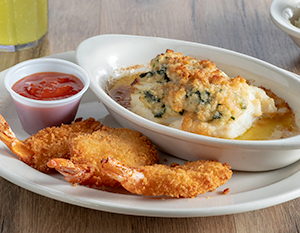 Enjoy our Nantucket Cod and three crispy butterflied shrimp tossed in OLD BAY® Seasoning. We serve it with a side of cocktail sauce, your choice of two sides, and our bakery-fresh rolls. Mmm… Marsala! 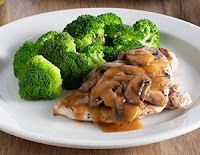 Try this juicy, grilled chicken breast that’s topped with our Marsala wine sauce and grilled mushrooms. It’s served with two sides and bakery-fresh rolls. 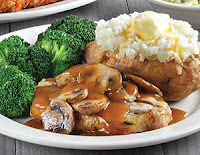 A twist on the classic, we top a grilled, boneless pork chop with our Marsala wine sauce and grilled mushrooms. Plus, we serve it with two sides and bakery-fresh rolls. A snow day favorite reinvented as a grown-up dessert. 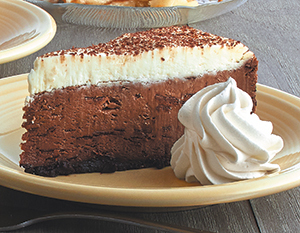 Indulge in milk chocolate and dark chocolate cheesecake, topped with vanilla mousse. Did we mention this dessert is gluten friendly?! Score! Warm up with a smile and our Raspberry Hot Chocolate! 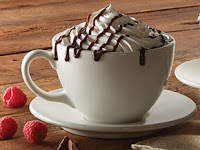 It comes with one free refill and is the perfect way to warm the soul. This full-bodied coffee is cold brewed for smooth flavor without the acidity. 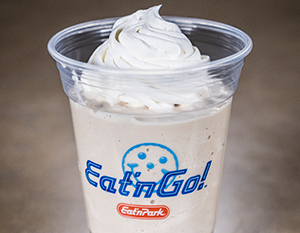 Now available in four different flavors: Regular, Chocolate, Vanilla, or Caramel. 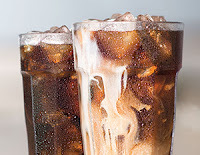 Featuring our cold brewed coffee, try a Cold Brew Milkshake in four great flavors: Regular, Chocolate, Vanilla, or Caramel. Our newest Fountain beverage, enjoy unlimited refills of Tropicana® Fruit Punch! I’m soooo excited for a gluten free cheesecake! Thank you!! Our family loves Eat 'n' Park. We eat there often! 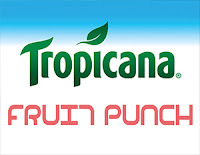 New Coupon for $3 off $20! Salad Bar Dinner Deals: Available All Day!